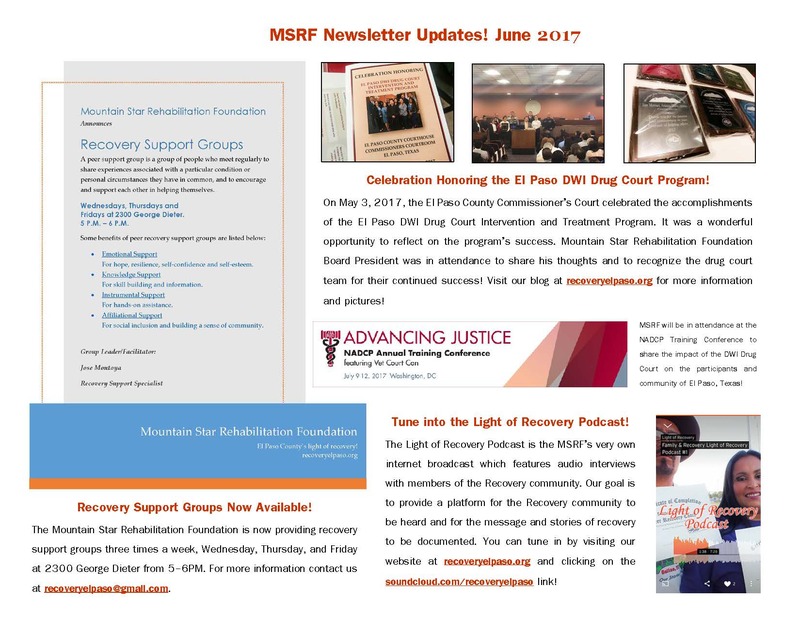 Introducing the MSRF Newsletter! The newsletter includes updates and announcements from the Mountain Star Rehabilitation Foundation to keep the community and our partners informed of our activities and progress! You can view the newsletter by clicking on the images below or download the newsletter as a PDF: DOWNLOAD! ‘Like’ our page. To participants, graduates, and family members of the DWI Drug Court connect with us and share photographs of graduation events and accomplishments in the community! On May 3, 2017, the El Paso County Commissioner’s Court celebrated the accomplishments of the El Paso DWI Drug Court Intervention and Treatment Program. It was a wonderful opportunity to reflect on the program’s success. 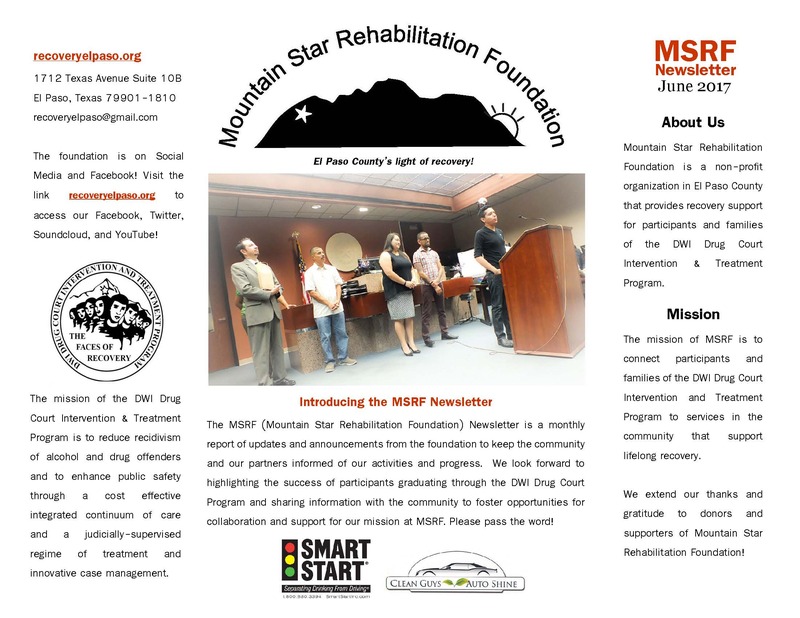 Mountain Star Rehabilitation Foundation Board President was in attendance to share his thoughts and to recognize the drug court team for their continued success! Special thanks to the office of Andrew Haggerty for documenting the photograph featured above of Mountain Star Rehabilitation Foundation Board President Jose Montoya and the photograph featured below of those in attendance. Below is a photo of recognition plaques for members of the El Paso DWI Drug Court team from the Mountain Star Rehabilitation Foundation. This month we’re kicking off the new year and the Light of Recovery Podcast #3 with Ernesto Valdez, a recent graduate of the DWI Drug Court Intervention & Treatment Program and a champion of recovery in the El Paso community. You can listen to the podcast in its entirety on the Light of Recovery podcast Soundcloud page at soundcloud.com/recoveryelpaso. This month’s podcast also features a special outro of an audio recording that holds special significance to Mr. Valdez’s recovery story. To learn more visit our blog or check out the details on Soundcloud!